Moodle in English: New iPhone app --- mPage is available! Let me introduce a FREE iphone app --- mPage for Moodle. mPage will be available on App Store on 8th May 2010 (EST) FREE for download. mPage web service is available for download at Moodle.org or mPage.hk. This web service can update itself automatically. You don't have to update it yourself. mPage is the application for Moodle on iPhone and iPod Touch. With mPage, teachers and students can use most resources and activities modules from their Moodle courses. mPage version 1.0 supports Moodle 1.6x, 1.7x, 1.8x and 1.9x (to the latest version of 1.98). For iPhone and iPod Touch, we are supporting OS 3 or later. mPage supports both activities modules and blocks development of Moodle. mPage is an on-going project of Moodle.hk that we aim to support ALL activities and blocks modules for all Moodlers around the world. Please consider how fast mPage can load a Moodle page within only 0.5 second. Here's our technical explanations. We have organized forums and tracker for users. You can even help edit the documentation. Please also check out the roadmap of mPage. Available at App Store now! mPage is available on App Store FREE for download. If you want to talk to us directly, please select a phone from here that you don't have to make long distance call. We have more than 40 office numbers around the world. I downloaded the app to my iPad. I downloaded the "mobile" directory and put it at the main level of my Moodle site. It doesn't work. More specifically, the error message says "This Moodle server has not installed the mPage web service." The web site has no documentation - it's an empty wiki. First, thanks for trying mPage. If it logs you in onto any of our demo sites, the mPage works on your iPad. And then, try to see if you have unzipped the "mobile" directory correctly. You have to unzip the file, "mobile.zip" first. You can do this either by unzipping the file, "mobile.zip" on your computer or by extracting "mobile.zip" on your server. If you extracted it on your computer, you will find 3 files containing in a folder, named "mobile". Then, you upload the whole folder, "mobile" onto your "main level" of Moodle. If the mobile folder is in the correct location, the three files in it should work with mPage (on your iPad). I hope the above can help. I shall include detailed explanation in the wiki ASAP. Nope, doesn't work. I can log into a test server on my iPad, but when I go to my Moodle site, I get the "not installed" error. My site is set to require login, as many Moodle sites are... would that make a difference? Nope. Tried it on a different one of our sites that does not require login. It doesn't work there, either. Can you send me the URL of your two sites by responding here or by email to me? BTW, which versions of Moodle are your two sites installed with? It's good to know that you can log in the test server, which means the mPage on your iPad is running okay. "My site is set to require login, as many Moodle sites are... would that make a difference?" No, the first thing mPage does is to "validate" your Moodle server to see if your "mobile" folder contains 3 files (after unzipping). It doesn't matter whether your site is set to "login" ---- mPage can log you in, or even create an account, or do many other things, once it has "validated" your site. So, the first thing to do is to make sure your "mobile" folder contains 3 files, not another "mobile" sub-folder. The 3 files should be index.php, lib.php and main.php. I have also responded to your 3rd post in my previous post. This Moodle server has not installed the mPage web service. But as you can see from the image below, it's there. By the way, the sample mPage moodle sites on the iphone do work. Thanks for your installation of mPage. Pleased to know that mPage on your iPhone works on the sample moodle sites. Regarding your sites, it's clear that the "mobile" is installed correctly. Can you send me the URL of your Moodle sites either by responding here or by sending me an email? Also, I would like to know which versions of Moodle your sites are installed with. Thanks. Obviously, the mobile folder is correctly placed. We are looking into your Moodle at the moment. I hope we can find out the reason ASAP. Just to let you know we are working on it. Get back to you later. Can you send me the error_log file found in the mobile folder installed on your Moodle server? Please send me by email. Or, if it is not too much trouble, you may upload the file to the forum at http://mpage.hk/mod/forum/view.php?id=13. I apologize for the mess in the past 48 hours after mPage was launched. The downloading service is now resumed. please kindly remove it and replace with the one from here. I guess I have one concern I would like to hear addressed. i notice that your webservice "calls home". In your notes this is listed as being for upgrade purposes. This would make many admins a little nervous considering that data that travels through the webservice you created. Is this really a major requirement? Would it not be better to remove this to ease security concerns. Thanks for your advice. I understand your concern. As I use Moodle for quite some time, I have done many upgrades before, as most Moodlers do. Most of the time, I don't upgrade my current version. Instead, I upgrade by building a new Moodle on my server. That's why many of us have more than 5 or 6 copies of Moodles, and some of us even have 10. At the same time, we would also add our favourite plugins to our newly installed Moodle. I think most of us have the experience that we may simply copy some blocks directly within our old Moodles onto the new one, because it's faster and more convenient. Certainly we can search for the plugins at Moodle.org and download the latest ones. It's a bit time consuming. This explains that when I have a chance to serve the community, I hope to make things easier and more user friendly. When I create this web service, I have to solve the problem of upgrading the web service folders (on all Moodle servers) immediately after we have improved codes. For iPhones, we would know that whenever we click the App Store, we would be notified immediately of the upgrades. For Windows OS and Mac OS, when we turn on our computers, we would be notified of the latest upgrades. On the other hand, as we are working on our schedule to add compatability to more modules for Moodle, we would be amending our web service files once every few days. This means that mPage users only install the web service folder once. Whenever they upgrade the mPage from App Store, they don't have to upgrade the web service folder. Everything is auto. Let's see how we schedule. In two weeks' time, we will have a full function 3D-forum interface on mPage. In another two more weeks, we will have the quiz interface that supports 2 question types for every two weeks. Our upgrade plans are targeted to provide supports for more modules. However, for most plugins at Moodle, their upgrades depend mainly on Moodle versions. Therefore, if we do not have better upgrade plan, users may find it diificult to follow our different "latest" versions of upgrades. Just a motive to test on auto-updates for Moodle. I hope it would not create much concern as far as we feel the same with upgrade notices from iTunes, Safari, IE, Firefox, HP Printer drivers, Skype, etc. or upgrades on all iPhone or iPod apps. But still, I am open to alternatives because I am here to serve. Forgive me If i misunderstand what you are proposing. As I understand, its a huge security hole to let an application write php files to the actual server itself. When an admin installs a mod which is downloaded it is up to them to look at the files and decide whether to install it or not, or make changes or not. There was a process that you went through to ensure your iphone app was okay and up to scratch. Now you propose to allow you to have write access to install unknown code on live servers of Moodle users. I can tell you now, that its a big ask to allow this kind of access, , and I do not know any server admin who would allow a php application update itself in this way. - if it is an "older" one, alert the user to recommend that their Moodle server upgrades to the latest version and provide the email functionality as you do now. And possibly even provide the url to the latest version in the mail. Your application is really very nice, and I like it, and I would love to recommend it to people and clients. However, with this possible backdoor into the Moodle site, that is not possible. I'd strongly second Gavin here - apps that a user runs him/herself, if they get a bad update, usually only can affect the user or maybe a few others that use that machine. A Moodle server admin is responsible for all the users on his/her site. That might be 1000s to 10,000s of users. So sysadmins tend to be very careful of what code runs on their servers. SysAdmins are also not like other users, in that it's their job to keep their code updated, so if you post in the forums when you update mPage, you'll find most will update if they are using the app. We're demoing Moodle mobile options to some big mobile carriers, I'd love to show them mPage, but I can't load it until you remove the auto-update feature. I agree. Julian has actually expressed the concern of most site admin. So, I have already rebuilt a new mobile.zip file, which is available at our download site from here. For anyone who has downloaded, please kindly remove your "mobile" folder and replace with the one from above. To be informed of the latest file, please make sure you register at our website at http://mpage.hk. We shall inform you of the latest file with our Site News from time to time. Can anyone verify that the security hole has been removed please? I'm looking at this app now and glad I didn't just fling the mobile/ folder onto the server without a forums read. The official app is requiring a moodle upgrade to allow the access to resources functionality, and given the headache v2.1 took I can't see that happening before summer. Thanks, but we run moodle 2.1 so this is no use. Unless you've built a moodle 2-compliant version of the code. I am excited to announce that after the release of version 1.3.6 in one week, we would upload our iMoodle 2.0 to support all Moodle versions (both 1.9.x and 2.x) to the App Store, expecting the hottest release in April. Can you feedback here to see if it works? If it still doesn't work, try to check out the FAQ. Will do, soon as I can. I have been assigned a big project that is taking all of my time, so it might be a little while. I've installed mobile on http://teachereducation.org.uk/moodle (version 1.9.3) and on http://gelttp.com/moodle (verion 1.9.6+). Thanks for your information. We shall be looking into your Moodle sites and get back to you on Monday (HKT). Can you send me the error_log file found in the mobile folder installed on your Moodle servers? Please send me by email. There is no error-Log file in the mobile folder on either of the moodle servers. Is there an error log file that I need to upload first to log errors? Plan A: Try to remove the mobile folder. 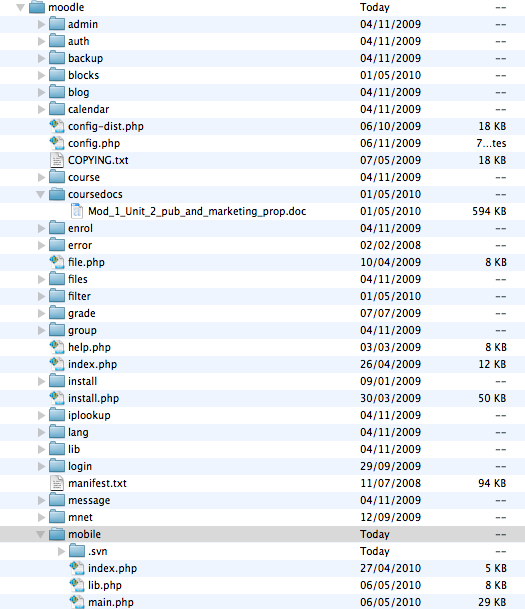 Replace it with the mobile folder by unzipping the attached mobile.zip. See if it works. Plan B: If it doesn't work, please check email. I've done Plan A. I didn't work. Plan B: I assume you mean the point about checking error logs? I don't know how to access them on my Centos5 server. PS We seem to be having this discussion in several forums. Could we not keep all postings in one place? I get the exact same thing. The mobile folder is in the correct location, and the error says it has not been installed. Sorry for the inconvenience caused. The mobile folder will be replaced ASAP. Great! Please let us know so we can try and test again. Re: New iPhone app --- mPage is available! 1. upload [mobile.zip] to /website/moodlesite/ then unzip it there. 5. select Notifications to install mobile block. buy it and install it in the iPhone (not mPage 2G). 3. open mPage in iPhone. 5. login with username and password > Done. PS.... at what point did you decide to start charging?